Prepaid car rental rates often have a well-deserved reputation for being inflexible. In most cases, including with Priceline's Express Deals, the renter is required to pay in advance with no option to cancel or change the reservation. The renter is locked into the dates, times, location, and price without the potential for a refund—even in an emergency. At AutoSlash, we wanted to rethink prepaid rates to help renters take advantage of the money-saving benefits along with some flexibility. That's why when we launched our new Slash Deals prepaid rates, we made sure that they can be canceled up to 48 hours before pick up with no penalty. Don't worry: the popular, discounted pay-at-counter rates we've found for you since AutoSlash launched aren't going anywhere. These Slash Deals are an additional option available to renters side-by-side with the same Free Cancellation rates we've always provided;, so it's truly always the renter's choice. Prepaying for a Slash Deal, which can be canceled up to 48 hours before pickup. The penalty-free cancellation component is a notable point of difference, and Slash Deals always include unlimited miles. Our prepaid rates are now more flexible than many of the prepaid rates offered directly by the rental car companies themselves. How to Book a Slash Deals Rate? 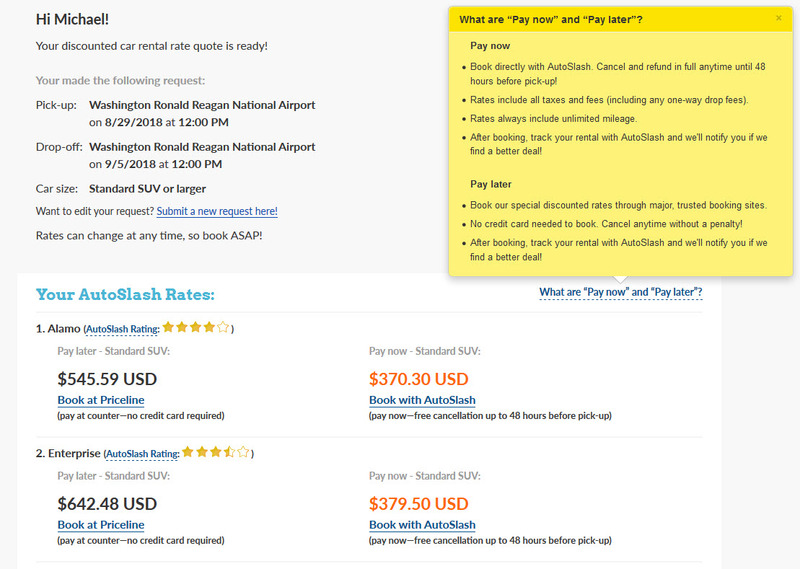 The quote you receive will clearly signify which rates are Free Cancellation / Pay Later rates and which are prepaid Slash Deals, such as this listing for standard SUVs at Washington National Airport, where prepaid rates are significantly cheaper than the Free Cancellation / Pay Later rates. The flexible prepaid rate is much easier on the wallet. In this example, prepaying locks in a rate of $370.30 while the cheapest regular rate currently available is $545.59. While there's still a lot of time before the pickup date, the argument to lock in the prepaid rate now is compelling. After all, a savings of $175.29 is just a starting point. The renter still can save even more if rates drop before the pickup date. Better yet, there are no fees for canceling this type of reservation until 48 hours before pickup. When Should You Consider a Slash Deal? The prepaid rate is lower than the regular pay-later rate. The renter has definite plan at least 48 hours in advance. The renter does not want special products and services based upon memberships. The renter is willing to forego frequent renter program benefits. Those last two items are the trade-offs of offering a prepaid rate that can be canceled up to 48 hours before pickup without penalty. You cannot add special discount codes to discounted prepaid rates to help avoid service fees like additional driver fees or child safety seats. Similarly, memberships to groups such as AAA or Costco can't be used with prepaid rates. Prepaid rates also count as discounted industry rates so you cannot add a frequent renter number for benefits. In contrast, our pay-later rates are standard rates that allow you to enter your frequent renter program number. What Are the Rules for Slash Deals? Before you rent any car or sign a contract. the rental policies will be disclosed as with any other rental car reservation. Be sure to read the rules before booking to avoid headaches later. Those policies include driver license verification, checks against the Do Not Rent list, requiring a credit card in the renter's name at the time of rental, and geographic restrictions. Slash Deals are another money-saving option for renters, especially those who are certain of their travel plans.When Slash Deals are available, the renter still holds the final choice of a rental car company and the type of rate booked. To get started, just make a quick quote request to receive the best prices available today.